The OCHO Coconut Bar has a delicious coconut center covered in dark chocolate, and it's made with organic ingredients. 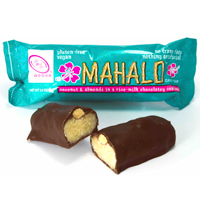 A great vegan candy bar option! "Have an OCHO bar and enjoy your day." Ingredients: Organic dark chocolate (organic chocolate liquor, organic dried cane syrup, organic cocoa butter, organic soy lecithin (emulsifier), organic vanilla extract), organic tapioca, organic coconut, organic sugar (evaporated cane juice, tapioca starch), water, salt, organic soy lecithin, and organic vaniilla extract. From the package: Made on shared equipment that processes peanuts, tree nuts, milk, and eggs. May contain peanuts. I absolutely Love this Bar first tried it from (...) I was getting my veggies and fruit and thought I try the bar because I love coconut and chocolate so much. Now I'm hooked and telling everyone. I'm so happy because it vegan. Thank YOU FOR this TREAT. These are heavenly, especially if you can no longer eat gluten or dairy. Very yummy!